The original car of the future, KITT was a seriously customised Pontiac Firebird Trans-Am that jammed a whole load of tech additions into that sleek black frame. From the telephone comlink and heads-up display to the always handy medical scanner, KITT was way ahead of its time and it looks just as cool recreated in Lego. Extra credit has to be given for the Lego-headed Hoff. We already have the Millenium Falcon from Star Wars crafted from Lego blocks, so it only seems right to follow suit and award the same honour to the USS Enterprise from Star Trek. Sadly, this creation was suggested on Lego's crowd-sourcing ideas site CUUSOO but was laid to rest due to trademark issues. Looking at the success of Lego Star Wars, if there's any dating sci-fi franchises out there listening, get your stuff made in Lego now! The most instantly recognisable vehicle from Mr.Bond's mammoth garage, the Aston Martin DB5 was the epitome of cool. First gracing the screen in Goldfinger, it recently made a reappearance in Skyfall, to the joy of Bond fans everywhere. 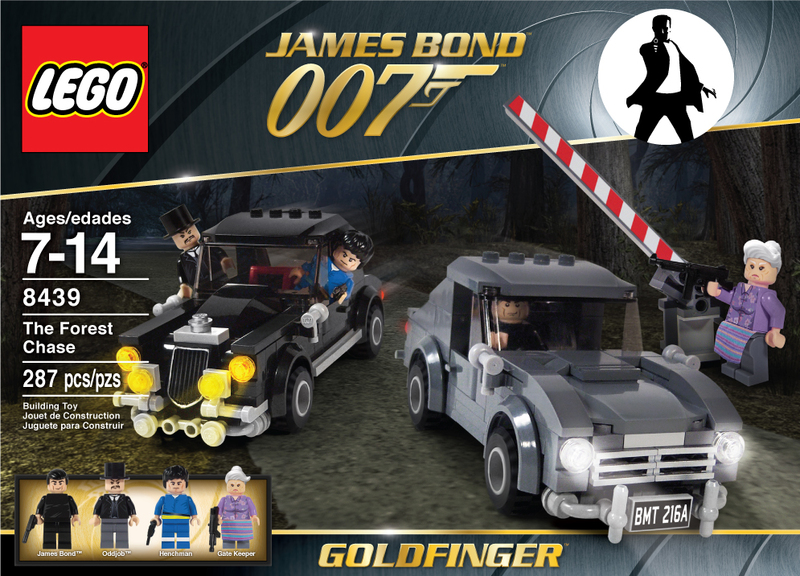 To pass mustard Bond's Lego set would have to feature that vast array of gadget add-ons: like the ejector seat, radiator dual-cannons and of course the oil slick. The shoulder cannon, or Plasma Caster to give its proper name is truly a deadly weapon, fired more times than not with supreme accuracy, it really made Predator one of cinema's deadliest enemies. We'd love to see the big screen's ugliest motherflipper remade in glorious technicoloured brick, complete with dense jungle and of course Arnie. "GET TO THE CHOPPA!" You don't often see Lego splattered in blood and bearing an 18+ rating, but come on, you can't really produce a child friendly version of Leatherface brandishing the iconic chainsaw can you? We certainly think not. Maybe this would kick start a new line of horror themed Lego sets, with the pack full of detached yellow heads and single arms. This exoskeleton from Aliens really showed how far the sequel had come from its relatively simple original outing. Strapping soldiers into whopping great robotic bodies was far more blockbuster than anything seen in Alien, but it allowed the tech to really shine. The Power Loader was powered by a hydrogen fuel cell and its main use was for general lifting, though, obviously it didn't stop there. We'd love this to come bundled with an Xenomorph, so we set up our own Alien battle. Not looking to dissimilar from a set of Lego Technic, this recreation of Johnny 5 from the film, 'Short Circuit' is a pretty authentic build of the robot who develops human-like feelings. A special mention goes to the eyes, they look great. RoboCop is full to bursting with futuristic (for its time and even now) tech, from the insnae weapons to Alex Murphy himself. The ED-209 is one of those such things, acting as extra protection, it's a powerful machine with some serious firepower. Pair it with an Lego Star Wars AT-AT for full-on robot battles. While we doubt the mass market appeal of this set from the cult classic Total Recall (the less said about the remake the better), we'd be first in line to pick one up. Even the idea of a Lego man modelled after Arnie himself sounds good - would they recreate his trademark muscles? Of the eye-popping dream scene? We'd hope so.